From the Hancock County Courthouse, travel east 2 blocks on Broad Street. Turn right on Boland Street and travel 2.8 miles to Brown Chapel Rd. Turn left. Travel 0.8 mile. 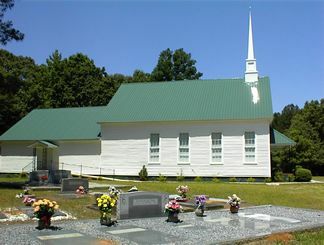 The cemetery is on the right at the church. As you face the church, graves on the right of the church are marked as side R; on the left, as side L.
Graves added since the survey that are not identified as in a particular lot are specified as side X. 3 graves: 2 adult and 1 infant next to Grady Epps. A new stone without first name of Thomas. Kimbrough listed first name as Thomas. w/o Joshua Baily Jackson, m. Dec. 20, 1849. No death date. m. Mary Ann Alford Dec. 20, 1849, per Mary Ann Alford's gravestone. On same gravestone as Joseph Reed Johnson. d/o A. M. and M. S. Johnson. "Gone to a fairer land of pleasure and love, To join the bright band of angels above"
Only one date on gravestone. "Mother". Metal post has 1899 as birth year, slab has what looks like 1894 as birth year. "Love always - Mama, Daddy, Brother"
w/o J. E. Epps. Metal marker. h/o A. R. Epps. Cement blocks mark the grave. 2-4 graves marked by concrete blocks. d/o Mr. & Mrs. W. A. Batchelor. s/o Mr. & Mrs. W. A. Batchelor. Wife of John Henry Batchelor, per obituary. Buried somewhere in this cemetery. Died after cemetery survey. Scattered rocks could indicate graves in this area. A cement block - may or may not indicate a grave. Georgia Wagoner Sup. Co. 326 Inf. Elizabeth is spelled with 'e', not 'a'. Infant d/o Mr. & Mrs. Walter J. Lavender. One date on stone. Assumed as both birth and death. On same gravestone as Sallie B. Johnson. On same gravestone as Alf J. Johnson. Age 67 (first name, year and age per Kimbrough's list). 4 graves with one marked "A. Holsey Epps & Family"
2 possible graves marked with fieldstones. On same marker with the other 5 Herringdines listed here. On same marker with the other 5 Heringdines listed here. Some possible depressions or graves in an open area. "Father" On same gravestone as Susie J. Epps. "Mother" On same gravestone as Joseph B. Epps. An older second marker exists upon which the spelling of the middle name is "Thirmon"
"Mott". Road grader engraved on slab. Found in a previous survey but not found by these surveyors in 2003. Ga PFC 182 Inf. Americal Div. On same gravestone as Pierce Johnson. On same gravestone as Mae B. Johnson. "Seab and Honey" On same gravestone as Sebron T. Epps. Maiden name Johnson per obituary. "Pa". Welder emblem on gravestone. On same gravestone as Catherine J. Epps. No death date as of early 2002. "Jimmy" Buried somewhere in this cemetery. Died after cemetery survey. Buried somewhere in this cemetery. Died after cemetery survey. Wife of Paul Roberts. Maiden name per obituary. Buried somewhere in this cemetery. Died after cemetery survey. "Bud" Buried somewhere in this cemetery. Age 81. All info per obituary. Buried somewhere in this cemetery. Died after cemetery survey.